I don’t know how many people read my blog but I just want to say that I came back. I was extremely busy this semester because of teaching, researching and being sick. I don’t know why but I had headache for last few months so I couldn’t do any ‘extra’ works except ‘teaching’. And now I feel better than before (still I feel dizzy but getting better than last week) so I will continue to write my blog from this winter. During this winter holiday, I will start new research. Anyway, I will keep uploading blog entries about our lovely ajummas. Ajumma image taken in Seoul, Other images and videos taken in Singapore. I just made a video collage about ajumma. 오늘은 한글로 좀 다른 이야기를 적고 싶다. 사실 스마트 아줌마 블로그에 올리는 아줌마에 대한 이야기는 업로드해야할 이야기가 너무 많은데 요즘 마감 (제출해야 할 일이 생겨서)이 있었던터라 게으름에 거의 두 달 동안 포스팅이 없었다. 곧 돌아올 예정! 그나저나, 오늘은 -ish에 대해서 말하고 싶어졌다. 어린아이들의 화장이 불편하다는 기사를 읽으면서 들은 생각을 써놓고 싶어서. 나는 화장을 하지 않는다. 그리고 소위 말하는 (정말 싫은 표현이지만) “여성 여성”한 패션을 즐겨입지도 않는다. 아니 거의 입지 않는다. 하이힐도 신지 않고 (나는 키가 큰 편이고 또 사실 발이 아프기도 하고 또 허리 수술도 했기에 앞으로도 신을 일은 거의 없다고 본다), 그렇게 나는 나 좋은대로 입고 다녔었다. 사실 20-30대의 거의 대부분을 한국이 아닌 곳에서 지냈기에 더 편하게 넘겼을지도 모른다는 생각이 들기도 한다. 우선 나는 일부러 이렇게 하고 다니지는 않는다. 무슨 말이냐하면, 요즘에 이슈가 되고 있는 탈 코르셋 때문에 이렇게 하는게 아니다. (이런 질문도 받아봤음 최근에…탈 코르셋 때문에 그렇게 하고 다니시는 거죠?) 그저 내 생각에는 탈 코르셋은 일부러 화장을 안하고 꾸미지 않는것이 아니라 본인이 편하다고 생각하는 대로, 남의 눈을 의식하지않고 나 좋은대로 입고 다니는것 그리고 행동하는 것이 탈 코르셋이라고 생각한다. Yes, I still do and will do research about ajummas. I really like these cool ajummas and their amazing performances. I hope, I really hope I can do this kind of performances of ajummas and with ajummas in Korea someday. Go Ajummas!!! And I will be back to upload lots of photos and photo collages very soon. I have to finish some other writings first…. Park Mak-rye Halmeonee (grandmother) is a famous YouTuber in Korea. The name of her channel on YouTube is ‘Korea Grandma’. She has been creating videos since 2017. Even though she called herself grandma but I think she could be categorized as older ajumma group because ajummas should be considered with different age groups. As there is no specification of the age criteria to be ajummas, ajummas can be categorized inclusively. For this reason, the channel of ‘Korea Grandma’ might be one of good examples to show how smart ajummas present themselves through using social media, especially the way of using one person media in YouTube. New post will be coming very soon! 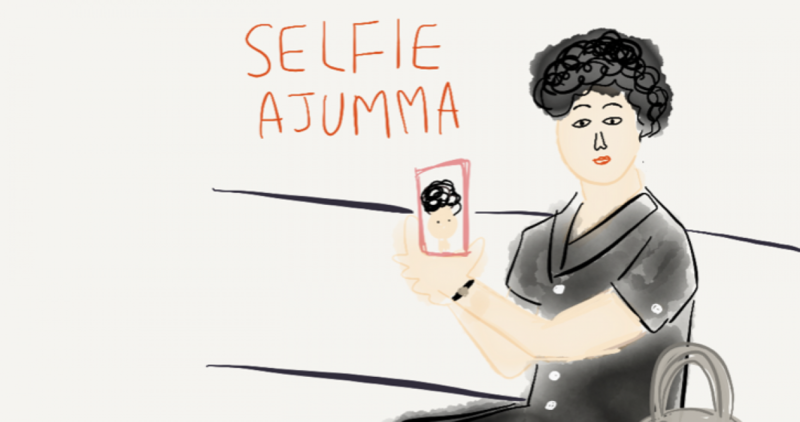 I’m currently writing about ‘ajummas’ and the deadline is coming very soon. So once I finish my writing, I will post new writings and photos in this blog for sure. And I’m thinking about reorganising some stuff in this blog as well.